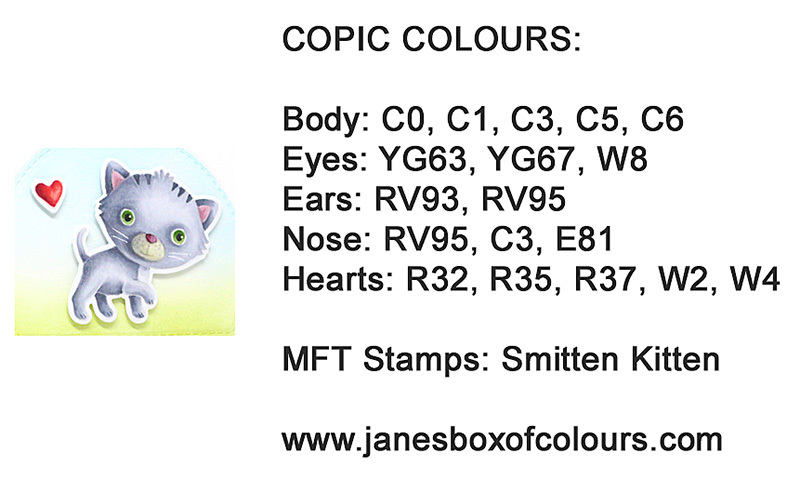 It's that time of the month when we start tempting you with some of the stamps that will be available in a few days.....and this adorable little critter is from the Smitten Kitten stamp set. Now, this is a little different from my usual card making style - having been inspired by my amazing teamies at the recent craft retreat. So a huge thanks to Karolyn Loncon for the inspiration and guidance to step away from the Copics, enabling me to create a background with blended ink and embossing! I still used the no-lines technique to colour the little kitten and hearts with Copics and then cut them out with the co-ordinating Die-namics dies, mounting them with foam pads to add dimension. Finishing it off with one of the sentiments from the stamp set which I stamped with MFT Cement Grey Premium Dye ink. Thanks for dropping by, I'll be back tomorrow for MFT Countdown Day 4! The coloring of the sweet kitten brigs it alive! I am mesmerized by your copic skills!! You make everything come to life!! Love your card with the adorable kitty!! So cute! Can't wait to try this set! What a cute Purrthday card. Oh how cute. Great design and coloring - and those eyes! Great Release! CUTE card it is so soft & sweet! The kitten is adorable, great card.